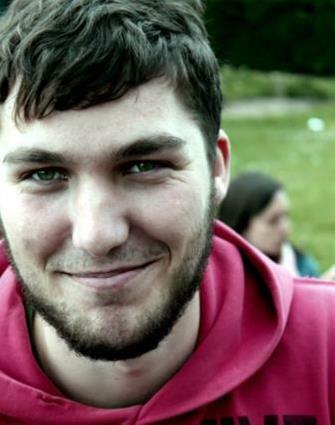 The Life+OZON project that started in 2013 came to an end at the end of June of this year. 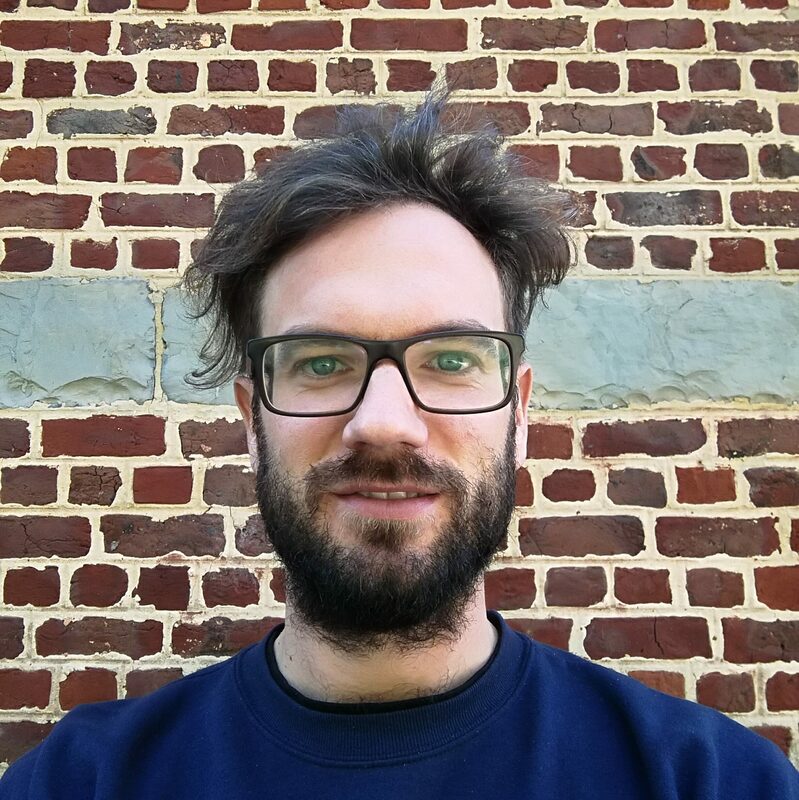 When you would like to learn more about the realisations and the results of the OZON project, you can read about it in our Layman’s report. The construction of Ecoduct Groenendaal was completed in early May 2018. At the same time, the former race track, located next to the entrance of the bridge, underwent a complete makeover. Since May 30th, a herd of 12 Scottish Highlanders grazes approximately 24 hectares (or 48 football pitches) of grassland, herbaceous cover and forest around the west side of the ecoduct. These cattle survive, year after year, on their own in the countryside. They keep the landscape semi-open by pruning, eating and trampling woody plants during the germination phase. By opening the closed turf, they also stimulate the development of all manner of herbs and woody plants. They spread seeds via their fur and manure. Their excrement is medicine-free, allowing mushrooms and dung beetles to enjoy it to the full. In 2017 and 2018, approximately 10,500 trees and shrubs were planted in the ecoduct’s vicinity. Species such as the Guelder rose (Viburnum opulus), common dogwood (Cornus sanguinea), rowan tree (Sorbus aucuparia) and field maple (Acer campestre) provide food for insects, birds and mammals. 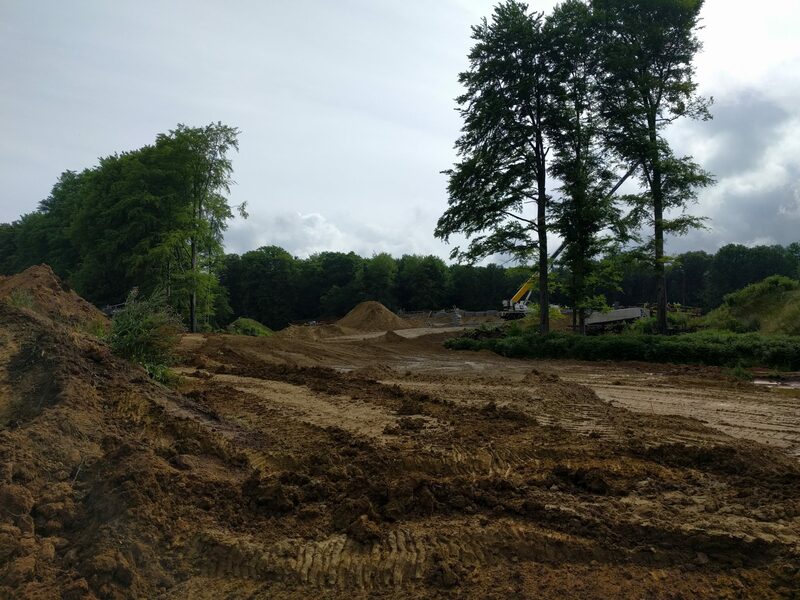 With help from the Scottish Highlanders, these will spread naturally over the coming years, allowing the former Groenendaal racecourse to further evolve into a semi-open grass landscape with species-rich forest edges that contribute to the biodiversity of the Sonian Forest. 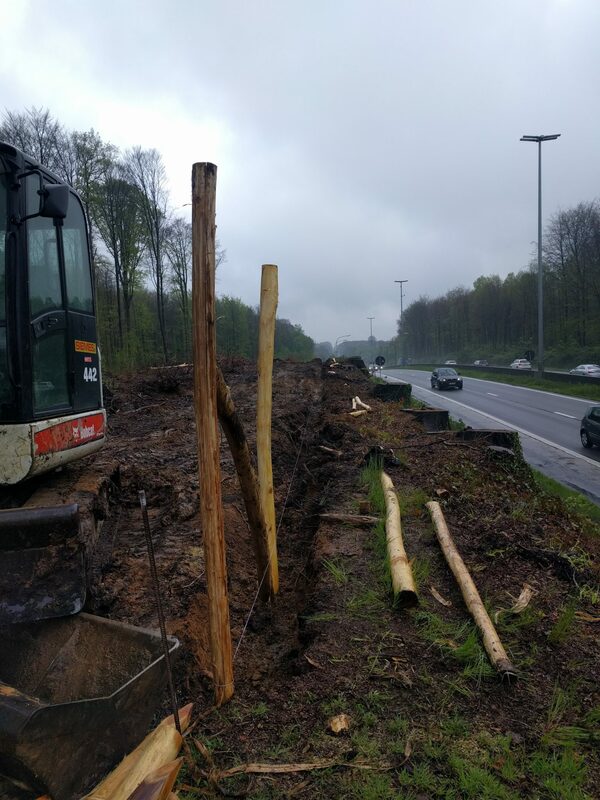 A total of 24 kilometres of eco-grid was placed along the R0 motorways (Brussels orbital) and E411 running through the Sonian Forest. This fencing connects several crossing points under (wildlife tunnels and fauna cylinders) and over the motorways (ecoduct and squirrel bridge). The eco-grid has a dual function: guiding animals to safe crossing points and creating a safe traffic situation for the tens of thousands of motorists who drive through the Sonian Forest every day. The two-metre high grid is buried in the ground, with fine-mesh gauze at the bottom and amphibian screens to the ecoduct entrances. This enables us to guide the various target species in the right direction. The two big construction sites of the project Life+OZON in the Sonian Forest are entering their final stage of complection. The wet weather conditions make the work particularly hard but the construction alongside the R0 and the E411 continues. The construction of the Ecoduct Groenendaal, the first ecopassage above the ring road around Brussels (R0), is in full progress. The Agencies Roads and Traffic and Nature and Forest invited graffiti artist DZIA to use the concrete-grey mid beam as his canvas. The result: colorful paintings show the animals that will use the nature passage in the Sonian Forest. Soon, it will be possible for drivers to admire the graffiti. Recently the beams were placed and now they are completing the construction of the deck of the bridge. This week the soil supply on the side of the inner ring road was also started. To guide the animals towards the ecoduct the steepness of the hillside can’t be too high. If the slope would be too high the animals might not use the bridge. That is the reason why we are transporting thousands m³ of soil. In the end the slope of the hill will be 7% which is accessible for all animal species. These works will continue until the 14th of July and will continue after the special holidays for people in construction businesses. On the 18th of April the construction of 24km Ecofence commenced. In the meantime, a lot of poles have been put into the ground. De poles are made of Robinia pseudoacacia and have been accredited with the FSC-label. They will be 2m aboveground and are placed by means of a crane. 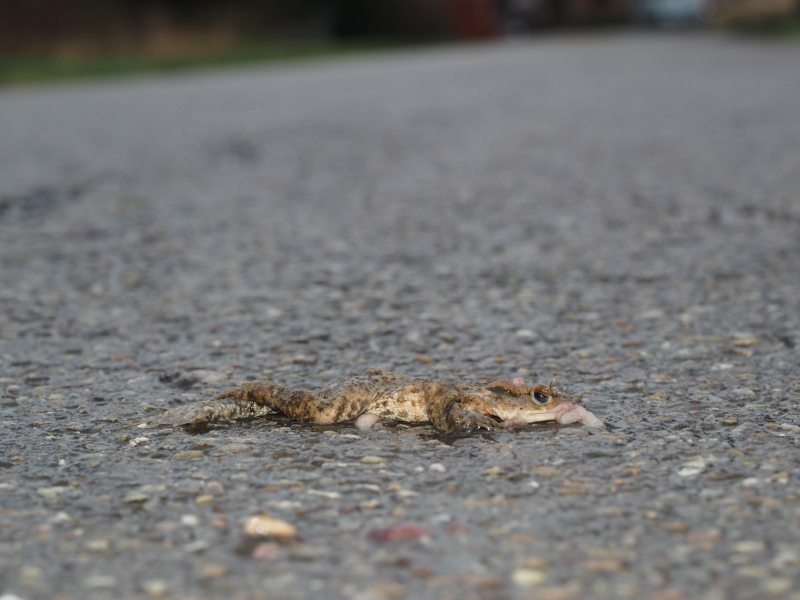 In 2016 more than 10.9 million animals died on the Belgian roads. This is apparent from counts that were commissioned by the Flemish government. That’s a 2.1 million or 23.86% increase compared to 2015. The counts were done over a large distance : 146 fixed routes were regularly checked by volunteers. Since the start of the project in 2013 the volunteers have travelled the world around (45. 679 km). The project runs until April 2017 after which the collected data is analysed by the Instituut van Natuur en Bosonderzoek. The general idea is to implement necessary measures that are based on the obtained information. One example of these kinds of measures is the Life+ OZON project, which is dedicated to defragmenting the Sonian Forest. 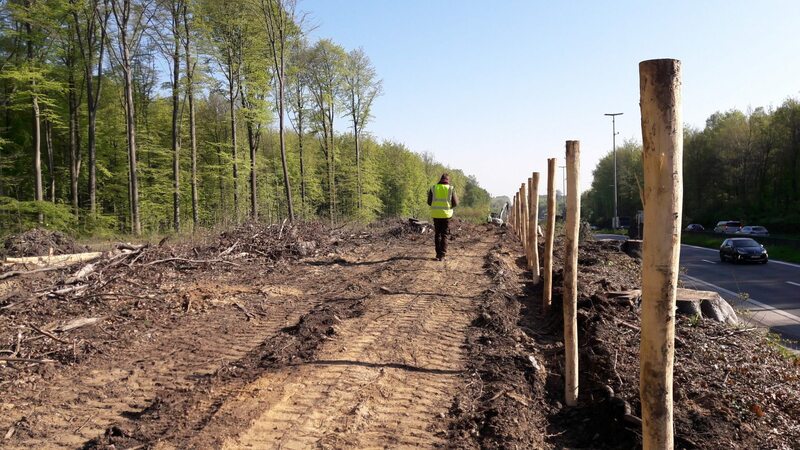 Within this project a wide range of measures are being/have already been taken such as, among other things, the construction of a 24 kilometer long wildlife screen along the E411 and RO, the construction and repair of wildlife tunnels and culverts, and the construction of a wildlife crossing in Groenendaal. All my life I’ve been fascinated by nature and that’s why I decided to study Green Management at the University College Ghent. Like a great deal of people, I became increasingly aware of climate change . and I decided to study Climate Studies at the university of Wageningen in the Netherlands. I learned a great deal about climate change and the therewith associated nature conservation issues. Recently I chose to support the Life+ OZON project. The Sonian Forest is Brussels respiratory system and it’s the home to a wide range of rare species. Our project ensures that the Sonian forest will be made whole again. Therefore it’s easy for me to motivate myself to do my utmost for the Sonian Forest and its inhabitants. It is my belief that I will complement the OZON team perfectly due to my high level of expertise and comprehensive education background. As a Brussels native, I have a soft spot for the Sonian Forest. Contributing to the sustainable development of the Sonian Forest, across different regions, poses a truly great challenge. I am confident that my expertise in coordinating sustainable development projects in higher education will contribute to the completion of the project’s many goals. The past few months I got to know the great commitment and enthusiasm of our many partners( AWV, IBGE,LNE,…) and ANB colleagues. Together we will defragment the Sonian Forest. Since 2006, wild boars have been spotted again in the Sonian Forest. However, the number of wild boars in the Sonian forest is limited to only a few specimen. This and the fact that wild boars are nocturnal animals, makes it quite difficult to take a picture of these animals. 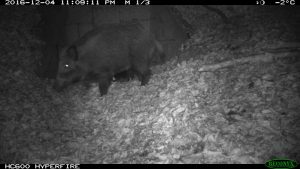 Via the monitoring of the Life+ Ozon project, in cooperation with Natuurpunt, we managed to once more photograph a wild boar. One of the fifteen wildlife cameras which had been placed throughout the forest recently took the picture below. For more information about the wild boar’s return to the Sonian Forest we refer you to the following link. 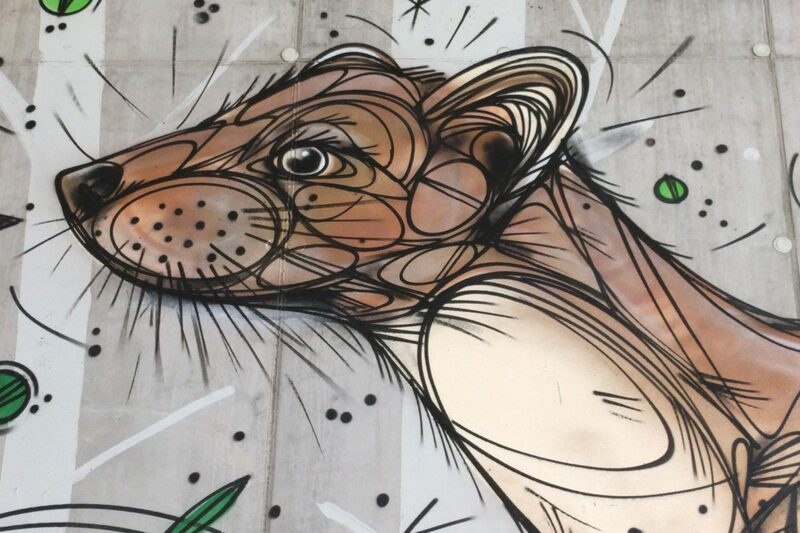 Have you spotted a wild boar yourself? Let us know via yoeri.bellemans@lne.vlaanderen.be or 0498 67 38 82.